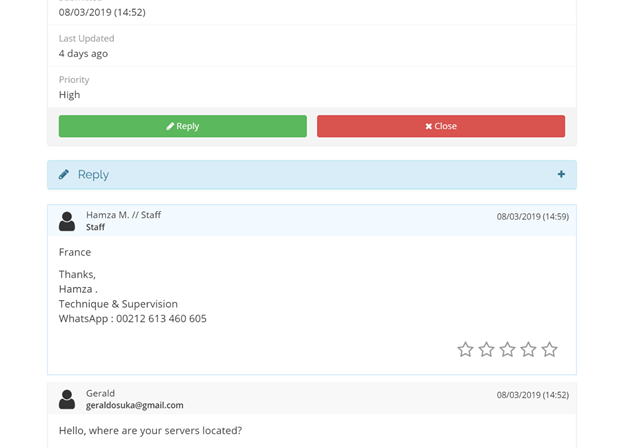 BbtServers Review 2019: Is BbtServers a Good Hosting? 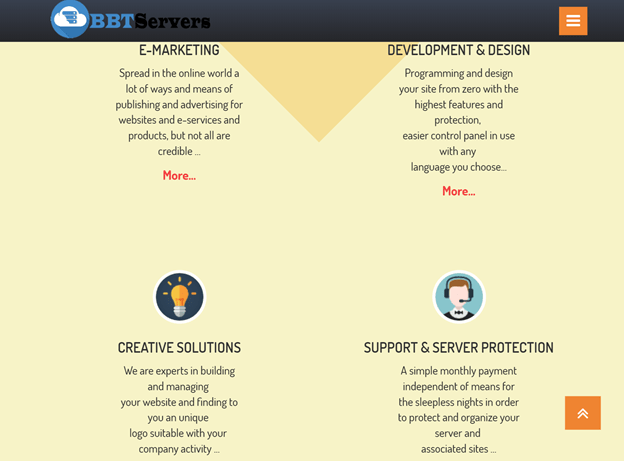 BbtServers is a web and server hosting provider which caters mainly to the Arabic speaking communities. It offers integrated solutions for shared hosting, VPS, dedicated servers, and smart layer servers. Since its inception in 2013, BbtServers has continually focused on providing server hosting solutions to the Arab hosting world. Its primary goal is to provide the best server-based services at affordable prices and to secure the largest hosting market share in the Arab speaking world. This vendor is dedicated to achieving ultimate customer satisfaction by maintaining a team of highly qualified developers and experienced website designers. This vendor’s hosting and VPS servers are situated in multiple locations all over the world and the website can be accessed in English or Arabic. The shared hosting package has four plans which start out with 10GB storage space and unlimited monthly traffic with possible upgrades of up to unlimited storage space. All storage is on the most recent storage technologies featuring RAID 10 configurations which maximize resource performance. All hosting is run on multiple servers which provide faster website loading speeds with a great uptime guarantee of 99.9%. Furthermore, for total control and easy management of your hosting resources, you are provided with cPanel across all hosting plans. This is a very simple and innovative yet very powerful control panel whose intuitive interface requires absolutely no technical knowledge to operate. The hosting plans featured on this vendor’s website are more expensive than the market standards. Apparently, if you proceed with ordering any of the plans, you will be directed to another webpage with a totally different shared hosting package. This package has five payable plans and a free trial plan but is out of stock. The payable plans are cheaper and have prices that are in line with the market standards. The most basic plan comes with 2GB storage space and 100GB monthly traffic, while the highest tier plan will get you up to 200GB storage spaces and unlimited monthly traffic. It’s quite a relief that you get a 30-day money-back guarantee especially with these contrasting hosting packages. Use this period to make sure that your preferred plan will satisfy all of your hosting needs. If that’s not the case, just back out within the month and claim your refund. All hosting plans have monthly and annual billing cycles payable through PayPal, Bitcoin, and direct transfers. As for customer support, you won’t get satisfactory help from the few items in the knowledge base. Therefore it’s a good thing that 24/7 technical support is available and you can reach customer service agents for support via ticket, email, or WhatsApp. In my case, the agent personally replied to my ticket in less than ten minutes with a very brief but question specific answer. With multiple server locations and use of the latest storage technologies, BbtServers offer you fast and efficient hosting services with responsive 24/7 technical support and 99.9% uptime. Wondering how BbtServers stacks up against other Web Hosting companies? Enter any other Web Hosting company and we will give you a side-by-side comparison.